JACKSONVILLE – “A Night at Roy’s,” the Monique Burr Foundation for Children, Inc.’s (MBF) annual signature fundraising event, raised a record $65,000, as founder Ed Burr announced that Olympic gold medalist Shannon Miller has joined the Board of Directors and will help MBF expand its curriculum focus to include young athletes. Miller, a Jacksonville resident, mother and advocate for women and children’s health, is a passionate supporter of MBF’s prevention education programs and the need to deliver such resources to students in school as well as to young athletes. Miller remains the most decorated U.S. Olympic gymnast, male or female, with a total of 7 medals. 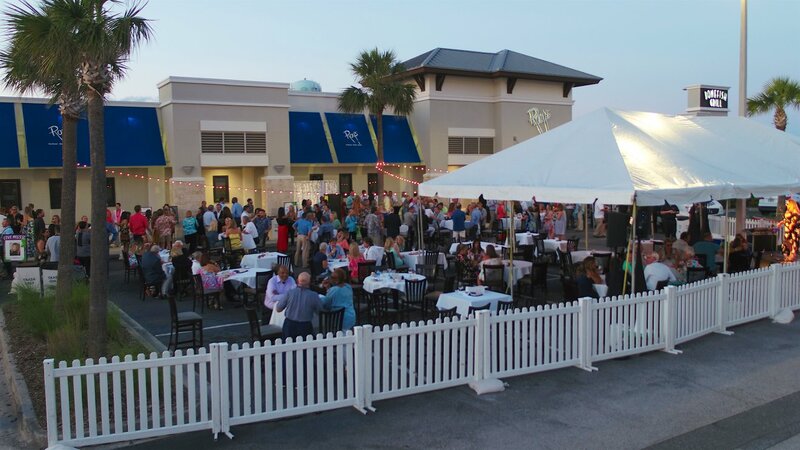 She told the more than 500 guests gathered at Roy’s Restaurant in Jacksonville Beach that she is committed to serving as an ambassador for the organization, using her voice and platform to help raise awareness around the state and nation. She and longtime board member Donna Orender, former president of the WNBA, will lead a task force spearheading the new curriculum development. Burr said Miller’s perspective and expertise could not come at a better time. Guests enjoyed contemporary, Hawaiian-influenced gourmet cuisine by James Beard Award Winner and world-renowned chef Roy Yamaguchi, along with tropical refreshments and wine and entertainment by Nashville artist Colleen Orender and local artist Will Harden. Harden, 15, helped craft and record MBF’s Safety Matters music video. A silent auction also helped raise funds. The money raised at “A Night at Roy’s” will help MBF continue to expand the breadth and reach of its prevention education programs. The Foundation’s MBF Child Safety Matters™ and MBF Teen Safety Matters™ programs are already delivered year-round to schools across Florida, and select communities across the country, and are designed to educate and empower students and adults with information and strategies to prevent bullying, cyberbullying, digital abuse and all types of child abuse and exploitation. MBF has reached over 2 million students in the past six years, and eventually wants to reach every child In the United States. Also serving on the MBF Board of Directors: Dennis Rosa; John C. Fletcher, Jr., Carr, Riggs and Ingram, CPAs and Advisors – Treasurer; Daniel Davis, JAX Chamber; Austin Burr, Assistant Project Manager |Financial Analyst; Maxine McBride, Clockwork Marketing Services, Inc.; Dianne E. Parker, Retired – Naval Air Station Jax, Fleet & Family Readiness; Bert C. Simon, Gartner, Brock & Simon; and Susie Wiles, Ballard Partners. For more information, visit www.mbfpreventioneducation.org or call (904) 642-0210.